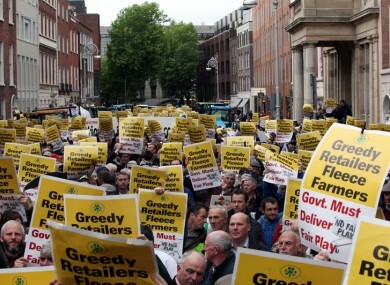 HUNDREDS OF FARMERS from around Ireland are this afternoon holding a protest against a raid on the headquarters of their trade union, as part of an investigation into alleged price-fixing. The headquarters were raided a fortnight ago as part of the Competition Authority’s investigation into allegations that farmers may have been involved in artificially fixing the price of milk at a level that exploited the consumer. That raid, the Irish Times reports, saw senior officials of the Irish Farmers’ Association questioned and computers and files seized – a move which has angered the union. The Competition Authority has explained that its actions were carried out in a professional manner, while the Department of Jobs, Enterprise and Innovation says it could not discuss an ongoing investigation being carried out by an independent body. As a result, farmers are convening at Merrion Square this afternoon before marching to Kildare Street, where the group will be addressed by IFA president John Bryan. While some protesters will be on tractors, RTÉ News says, most will be on foot. 82,000 members were informed of the protest by text message last Friday to inform them of the protest, which is also set to protest “failed regulation and flawed legislation that has allowed the powerful multiples to dominate the food supply chain and fleece farmers to bolster their profits”. Email “Farmers' union holds Dublin rally against raid on HQ”. Feedback on “Farmers' union holds Dublin rally against raid on HQ”.